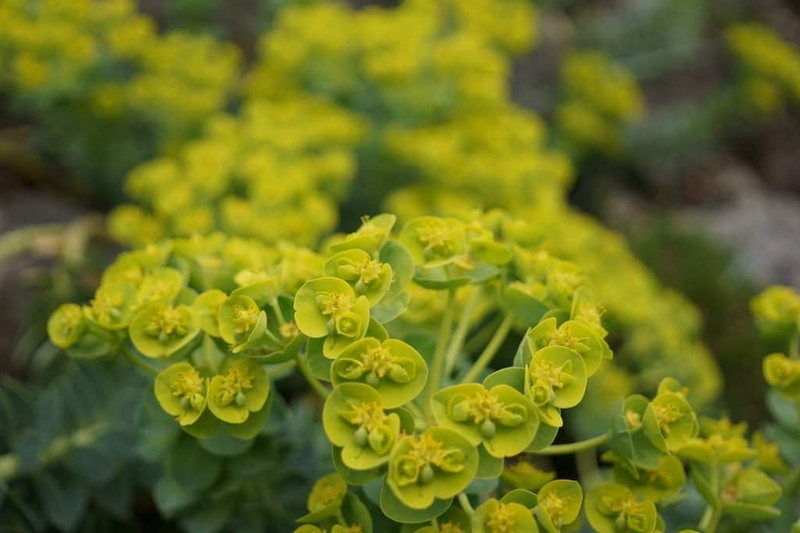 Myrtle spurge (Euphorbia myrsinites): growing, planting, caring. Euphorbia myrsinites - the myrtle spurge - is a succulent species of the spurge family Euphorbiaceae, native to southeastern Europe, cultivated as an ornamental plant and as a potted plant for its distinctive silver-gray foliage. It is an evergreen perennial with sprawling stems growing to 20–40 cm long, spirally arranged, fleshy, pale glaucous bluish-green, 1–2 cm long leaves and inconspicuous flowers in the spring. Plant your Corsican spurge in the sun or possibly semi shade in neutral limestone soil, even stony, from February to April and from September to November. Euphorbia prefer a soil not too rich but very drained. They are resistant to drought. Prepare the soil with some light digging (to decompact without necessarily turning it over with a pitchfork or broadfork), hoeing, and raking. Plant leaving 20 cm between the plants. Tamp the soil down well so that the roots are not in contact with air, then water generously. The first month, water twice a week if it does not rain. In during droughts, water once or twice a week. Water when the soil is dry, until the water that you pour does not rush into the ground, and forms a small puddle. The plant will develop a better root system if it has to fetch its water in depth. Unless otherwise specified, do not wet the foliage: the plants "drink" only by their roots. The multiplication of perennial euphorbia is done by dividing the tuft in March, or by cuttings from April to June. Be careful, it can be very irritating to the eyes. The regular pruning of euphorbia is not essential. However, you can fold down the stems in spring or fall, to limit the development of the plant. Trim right after the end of flowering to prevent seeds from sowing spontaneously. Simply cut the flower stalks about 5 cm off the ground.